Sometimes it requires a major exhibition abroad to convince Italians that they’ve got the world’s best artistic heritage. London’s Pompeii show is a case in point. 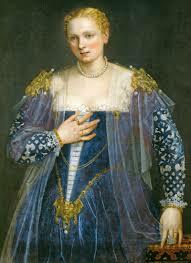 Another example was illustrated by a conference on painter Paolo Veronese (1528-1588) with important exhibitions to take place in the Veneto region (where this opulently great artist worked), held at the Italian Institute in London’s Belgrave square during my fleeting visit to that city. Evidently, the great success of the Veronese exhibition at the National gallery, which would end the following day, had stimulated the Italian authorities. After the conference, concluded by an excellent rinfresco of food characteristic of Veronese country, I rushed to take in the Veronesi on show at London’s premier gallery. Of course, I’d known and admired several Veronese pictures there and had been quite amazed at their size and luxurious details. The canvases are large because they served the same purpose as the Florentine frescoes – covering up large areas of wall – frescoes in Venice’s’ damp climate being a tricky business; luxurious, because Venice was still experiencing the heyday of its maritime empire with conquests extending to the Crimea and imports of rare spices, fabrics and jewels. 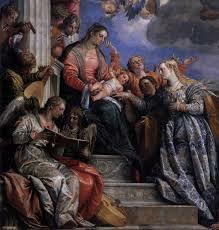 Veronese’s style epitomises the confidence of the Venetian republic but is in no way bombastic. His paintings may be full of pomp but are never pompous. Occasionally, however, Paolo Caliari, as he was originally known, overdid it and the exotic animals and expensive silks present in his painting of the “Last Supper” greatly upset the ecclesiastical authorities. So, with the simplest expedient, Veronese re-titled the painting, “Supper at the house of Levi”! The NG exhibition was beautifully presented with fifty examples of the artist’s works on show in seven rooms. Room one presented early works, including the intense “Temptation of Saint Anthony” from the Museum of Caen in France. Other pictures came from London, Vicenza and Florence. Room two contained portraits, always a favourite subject for me, and included the celebrated “Bella Nani”. Room three had the usual spate of religious paintings and altarpieces and comprised that languorous “Mystic Marriage of Saint Catherine” from Venice’s Accademia. (This alone was worth the price of entry to the show). 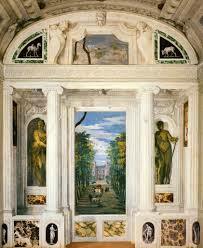 Room four epitomised the term most used in connection with Veronese: theatricality. So many of his paintings could almost be snapshots of actual dramatic representations and I wonder what Veronese’s’ involvement with the rise of opera and pageants might have been. Devotional pictures occupied room five and, because of commissions for private houses, many of them were on a much more intimate scale. Allegories and mythologies occupied room six, several of their meanings still obscure, although there is no doubt of their mastery of execution. The final room was dedicated to the master’s late works which are largely pietistic in inspiration and have even richer and darker colour palettes. The logistical difficulties of putting together the National Gallery Veronese exhibition, truly the first of its kind to reveal the importance of this painter, must have been immense. So many of the canvasses are huge and merely their transportation and hanging must have required operations of powerful delicacy. I am so glad that I managed to see at least this exhibition in London and to have, regretfully, given a miss to the Matisse. Now, this summer I shall be able to glut myself on as much Veronese as I like in situ thanks to the magnificent guides and itineraries to his works the Veneto region have planned. Combining Veronese with the villas of Palladio (strangely, they hardly ever worked together, except at the Villa Barbaro at Maser of 1561, the only such cycle by him to survive) must certainly be one way of approaching paradise on earth.